Ace Librarian | Ace up one's sleeve: "an important, effective, or decisive argument, resource, or advantage kept in reserve until needed." You should always have a good librarian up your sleeve. 23 Things was a campaign started by Helene Blowers that was intended to inspire librarians to get up to speed with Web 2.0 tools. In that spirit, this space is intended as a learning ground, and also gives me an opportunity to highlight and comment on the very best of the Library-World. I welcome discussion, as well as short pieces from contributors on books, libraries, and the world of information. Just email me to pitch your idea. My first contributor is Linda Frankel, with some new book reviews. See discussion by Stephen Abrams and commenters on the relevance of the 23 Things campaign five years later. We can distill from this exchange the necessity for librarians of lifelong learning, learning by doing, and keeping up with what’s current on the Web. 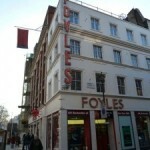 I think library leaders and staff would be interested in reading this article about Foyle’s, a London book retailer and their call for public input into their new flagship store. Replace “bookstore” with “library” (and booksellers with librarians) thoughout the article and you will be reminded of the changes we’ve no doubt heard about in the more forward-thinking libraries, as well as the questions that get pondered everyday in the library blogosphere. What makes a good bookshop [library]? Should second-hand be in the mix too? Is a café important? How do you incorporate digital? Foyles’ clarion call at the Bookseller’s FutureBook conference in London last week seeks to answer some of these questions. The retailer has joined forces with theBookseller to invite customers [patrons] and industry experts [library leaders] to help design its new flagship on Charing Cross Road, which it will move into in early 2014. With discoverability of increasing importance, the timing couldn’t be more apposite. Everyone is agreed that bricks and mortar bookshops [libraries] are under threat, but what elements are needed to make a physical bookstore [library] survive in an increasingly digital world? The parallels are obvious to anyone who works in a library. The similarities suggest that bookstores, often thought of as competitors to libraries, are suffering equally in the new digital world, and if they don’t quickly adapt, they might evolve out of existence. The article suggests that bookstores need to be community meeting places where books get recommended by real people, where they can learn about the newest e-readers, the newest digital offerings, and the apps that make them good book delivery devices, and where people can meet each other, enjoy café offerings and art, and in general be simultaneously stimulated and coddled. As a side note, I just had a lengthy conversation at a party about books and reading with an architect (who came of age during approximately the same decade), during which I realized that the last person he would think of consulting about his next read would be a librarian (!). I wanted to get more into that subject; however, readers advisory is not my best suit, at the moment, because I tend to recommend books I’ve read, and those might not be to everyone’s taste. But the best recommenders understand (or expertly explore) the tastes of their clients/patrons, and use readers advisory tools that deliver their next best read. I did explain to him that I use tools to recommend. The first obvious book recommender that is easy and free for everyone to use is Goodreads, but you have to put a bit of effort into it. They have a book recommender engine similar to Netflix. The more books you rate, the better the recommendations. Librarything is another obvious one. However, these are personal ones, and work only for you! Less well known is that your local library will probably have a literature/book database that provides you with readalikes if you specify the criteria (authors, styles, themes, content, stories that are similar to something you recently read and liked). My library uses Books & Authors (Gale Cengage Learning). And lastly, find a librarian who understands your tastes and can help you to your next read. But back to the Publishing Perspectives article on the new flagship bookstore in London. Author RogerTagholm has interviewed delegates from the Futurebook conference who have observed bookshops around the world as well as the strategies of electronics retailers. Who knows, you may see some of these realized in the future. But will you see them at your local library? Charlie Redmayne, CEO of Pottermore, believes — surprisingly — that a lesson can be learned from UK electronics retailer, Dixons. “Look at how they’ve thrived by improving their customer service — I think if you get that right, you can charge a premium. You need a store that stands up for selection, that finds the best books of real quality. You want to be advised by a real person. You want to go to a place where they understand books and where the recommendation is real, not the online version which is likely to be a self-published Amazon author. Libraries experience a constant tension between acquiring valued literature and popular stuff. As mentioned above, it is useful to go into an establishment and know that everything was already vetted for you. Librarians typically acquire only the most highly rated books, at least as their base. If budget allows, then patron tastes do somewhat control what other purchases are made. But you can depend on finding all the Newbury award winners, the National Book Awards, the NY Times 10 best, etc. Libraries of course benefit from having real people on staff who are trained to help you, who love books, and who have more experience with technology than the typical user. But I don’t want to wear out the parallels here, between bookshops and libraries, only emphasize that if this kind of brainstorming went on in the library planning world, we’d see some amazing flagship libraries! Which libraries can you think of that have already incorporated some of these future trends? Note: It’s great to see a slideshow of splendid libraries featured on HuffingtonPost today! It would be interesting to explore what these libraries feature besides the terrific spaces. A charming history of ALameda County from 1897 can be printed in this way — through Google Books. Serendipity in the library environment? The browsing experience deserves attention (and future posts here), especially as the way we browse has been changing so rapidly. When was the last time we lost ourselves in dusty stacks, stumbling upon serendipitous information that changed the course of our research or simply added to the awe we feel when in the presence of so much knowledge? This post from ACRLog captures today’s dilemma (about the stacks becoming more of a digital experience for today’s researchers–more convenient, yet less inspiring) very eloquently. I recently discussed with a friend how the browsing experience changes when a public library changes from a stable collection to a floating collection (stay tuned). Does this increase serendipity or just change the definition of a branch library. I am used to a branch library reflecting the tastes of its particular patron population. Enabling the Research ‘Flow’ and Serendipity in Today’s Digital Library Environment. What can libraries learn from Yahoo’s new CEO? In this interview, Marissa Meyer explains the thinking behind buying every Yahoo employee a smartphone of their choosing (Apple, Android, Windows). “You want the engineers, etc., to be able to create an amazing experience.” If the library was funded with an eye to the future, the equivalent action I would take would be to have every library staff member choose an e-reader, smartphone, or tablet. Everyone would become experts on their device, as far as downloading e-books and articles. The world is going mobile, and library patrons are no exceptions. Making sure that these devices interacted with the library effectively would become more of a priority. Another notable comment Meyer made was the observation that Yahoo has the content but lacks mobile hardware, browser, or social network, yet this very lack suggests that Yahoo is free to partner with the companies who do these things the best. It sounds like she wants to develop a unique Yahoo app for smartphone users. Libraries (queen of content) will develop their potential through partnerships. What are the most innovative partnerships happening right now, and what are some new ones that will create something equally exciting and create a turnaround in the library world?